Manitowoc ice makers are designed to be the most energy efficient ice machines available on the market. They are made with conservation as the primary goal. As far as ice makers go, they have definitely reached this goal. The offer state of the art technology in their air cooled machines. Manitowoc ice machines are beautiful machines that are designed to do more than just make ice. They are made to blend in to your kitchen, conserve energy, and give you ice in a steady supply. Should something defect, you can always get Manitowoc parts relatively easy. So here we are. The top three rated Manitowoc ice makers. You will be glad to see one of each of the three types of machines in the review. You will find that all three are air cooled machines, rather than water cooled. It is also pretty easy to find these Manitowoc ice makers parts This means that they are going to use less energy as well as less water. This is an undercounter ice machine. It is just the right size to place in virtually any space, as long as you have access to the water line. This ice machine is perfect for placing outside. It can give you 129 pounds of ice in any given day, making perfect for your next event. You will find that the large ice cubes are perfect for outside drinks as they don’t melt too quickly. Pros to this Manitowoc ice maker are the perfect size, quiet performance, and ease in which you can get the ice out. It will slide under your bar so that you always have ice right at your fingertips. The bin holds plenty of ice to keep all your company in steady supply. It is quiet enough that you will not have to turn up the music to drown it out. You will also find that it is at the right height to reach in and grab your ice without having to climb into the bin itself. You can purchase an extra scoop that fits right onto the hook on the side of the machine. 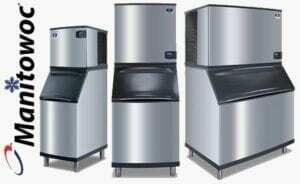 Take home Manitowoc Regular Cube Undercounter Ice Machine Today! The con of this ice machine is the installation. It is a hassle because you have to have a professional install it. It must have its own dedicated water line. If you don’t have one, it can be an added expense to have one installed. This is a full sized ice machine. It is meant for commercial use. It gives you huge amount of ice, over 500 pounds in a day. This machine produces full ice cubes. It is designed so that the ice maker itself sits on top of the ice bin. The ice bin is not refrigerated and does not require power. It is well insulated so that the ice does not melt too quickly. You are going to get soft ice from this machine, think motel ice. The pro to this machine is that once it is installed you have very little maintenance to keep it running its best. It really is one of those ice machines that you only need to set it up and forget it. As long as you have water and power, you are going to have ice. This ice machine is going to give you more than enough ice to keep your party supplied. Buy Manitowoc Full Ice Cube Machine Today! The downside to this ice machine is the sheer size. The ice maker itself isn’t that big, but the ice bin is. It is going to have to have its very own designated space. You are not going to be able to move it very easily once you get it into place. Also, when you are running low on ice, it is a pain to get to the bottom of the machine to get ice. This is the perfect ice machine for home use. It is designed more for a small office setting rather than a huge commercial setting. It will make about 53 pounds of ice in a day. The ice that is makes are medium sized cubed ice. These ice makers open like a mini fridge, on a hinged door setting. The pro to this machine is the size. It is perfect for a home or office. It gives you a good amount of ice that comes from a water line. It has a filter included, unlike other ice machines. You can find replacement filters with Manitowoc parts.The drain line is about 6 inches off the ground and can be tied into a drain, which is also different from the other Manitowoc ice machines on the list. Buy Manitowoc Ice Maker Today! The downside to this ice maker is the noise. It is considerably louder than most other machines. If you are going to install it in an office, this could definitely be a problem because it is going to cause distraction and it may make it difficult to talk over. You will not want it in a room where you have a steady conference going on.